Creating a Comic for Cricket Media's Spider Magazine. December 2017 issue for which my comic appears. "Written for that magical age when children first get excited about reading on their own, SPIDER magazine will reinforce a child’s love of reading by providing amazing stories and beautiful illustrations designed to keep young readers engaged. Pages filled with fantasy and adventure stories by celebrated authors, folk tales, non-fiction, poems, activities, and illustrations by famous children’s artists make SPIDER magazine for kids the perfect choice for newly independent readers." They have been around since 1994 and the comic is my first piece with them. I really enjoyed working on this piece and I hope it shows! Other than the print size of the inside front cover there weren’t many restrictions on what I could do. It had to be a comic and the art director said the topic should be about animals (no insects though as they appear throughout the magazine) or a winter theme. This is one of those times where sitting at your desk staring out the window or into space actually counts as work. Sometimes I’m trying to think what I should make for dinner, but sometimes its work! What could I come up with that would be fun to draw, funny and different? After thinking for awhile I started to doodle and came up with an idea explaining why birds fly south for the winter. Sketch for Bird Vacation idea. Birds appreciate the off-season at DisneyWorld just like everybody else! They’d probably get there really early too because the early bird gets the… WORM! That’s it! Nobody draws worms! They’re not cute, they have no face, no personality, they’re just a little tube. But a worm could fit the criteria of an animal to meet the theme requirement for the project. Soooo…worms sound great! I decided to use worms for characters. It was going to be fun to try to make them expressive and give them a personality. I decided to keep it to two characters, a brother and sister (see, conflict already!) named Kyle and Stacy who happened to be worms. Any parent knows that often you are summoned for “she pinched me…, he took my doll…, she ate my cookie…, etc”. So I chose to use one of these little sibling battles for the theme. I thought kids could relate to the injustice and parents could relate to being summoned for mediation and hopefully both would find it humorous. So I worked up a sketch for the second idea and sent them both off to the art director for feedback. Sketch of another idea for the comic featuring worm siblings. The art director, after sharing with her editor, came back said they loved the worm comic! I was very pleased that they found it very funny and also noted they loved the personalities and expressions! And no text changes to boot! Now with an approved story, layout and sketch I move right on into ink and color. I should note that more often than not, I start a project with pencil and paper. Good ‘ol tried and true traditional media. Can’t beat pencil and paper. However, with this project and working with the assumption I was going to be trying things out with panels, camera angles, expressions, etc. I chose to sketch digitally. I use a program called Sketchbook Pro and I really like it. Additionally, I can email it right away–no scanning. But now as I move into color, I go back to the traditional media. I find working out colors this way much simpler. I don’t have 16 million color options and tiny swatches the size of an elf’s pinky toe to poke at. I have a marker case, colored pencils and watercolor pans that give me plenty of options but make it easier to choose. Sometimes things happen in traditional media that add a nice touch, like organic imperfections or mixed colors that I will try to recreate digitally. In short, I think working with traditional media can improve your digital work. Next I experimented with colors using ink, markers, watercolor and colored pencils to work out the colors. I changed the background colors “adjusting the temperature” if you will. For example, it gets more red when they face each other as the argument heats up, bright yellow as Stacy fires back, and blue when Kyle absorbs the new insult. I’m please with the piece at this point, so now it’s time to go back to digital and finish it up. I scan the colored piece which will allow me to eye drop the colors in Photoshop. They usually need some tweaking but it is a good starting point and honors the color work I did traditionally. Ink complete and beginning to color. Final piece ready for publishing. There you have it! Wormy Rivalry out this month in Spider Magazine! Learn more and get yourself a subscription at Spider Magazine’s website. It is always an honor to work with the folks at Highlights Magazine. I read the magazine when I was a kid and it is such a thrill each and every time I am contacted for an assignment! Let’s go behind the scenes of my Sweet-Treats Schoolhouse assignment, illustrating a story by Maggie Murphy, which appears in the November 2017 issue. After I’m contacted and accept the assignment, the first step is to create some sketches. Typically when I work on a piece for the magazine, It is 6 months out from publication. So I started working on this piece in May! If you draw palm trees in December and snowmen in July, a job in illustration might be for you! Really rough doodle of the two main characters, Little Pig and Middle Pig. Rough sketch thinking about the camera angle. First I read the notes from the art director, Patrick. Then I read the story and doodle a little bit thinking about the characters. The first big decision I need to make is about the “camera” angle. The setting is a classroom in a gingerbread house and there are several characters that need to be visible. Should I place the camera at the upper front of the classroom? I make a quick sketch. I don’t like this solution because Thumblina who is already small is going to even smaller being in the rear of the classroom. I decide to try moving the camera to the upper left which will show all the characters better and have them facing into the story. Skyping with Rob McClurkan. Rob is my crit group partner, illustrator and good friend. You may notice the original title was The Sugary Sweet Schoolhouse. I make a more refined sketch and decide to put some other eyes on it before sending back to Patrick. For that, I contact my good friend, crit group buddy and fellow illustrator Rob McClurkan. Rob and I Skype and talk about ways to improve the sketch. Rob gives me some good tips and I refine the sketch a bit more and send off to Patrick. Now’s the part where I hop in my Lamborghini and go have tacos with my friends. The approved sketch shown in the context of the draft layout. Kidding! No, I must go to my next assignment that needs sketches silly! I’m so glamorous. When I get feedback on the sketches, the first thing Patrick asks me to fix are the naked swine. Why are the pigs naked? I have no idea. They made perfect sense when I drew them. On top of that, the little bear needs some clothes too. So after the necessary adjustments, I get an approval from Patrick to proceed to final. Which brings me to my next conundrum. Gingerbread. Lots of it. There is going to be a lot of gingerbread and chocolate which means brown is going to be a dominating color. I’ll need to find ways to brighten up the piece with the characters and the candy accents. And hope that when the ink hits the paper it doesn’t come off dark and drab. This is going to be tricky. I do some studies on paper with ink, markers and colored pencils thinking about color and details. I’ll finish the illustration digitally, but I like to work traditionally outside of the digital tools when I’m thinking and planning. Little things often happen traditionally I like that I will try to recreate digitally in the final. I find this process both challenging and enjoyable. Working out some color. You can see a gingerbread study in the upper right. Considering color and details for the pigs and desks. With some studies done I begin work on the final art. Now I’m looking at layout as well. Highlights has very capable people in place with Patrick and the designer, Dave that can handle the layout. But I decide to make a suggestion. I am looking at vignetting the art around the edges to make way for the title and other text. Which could work. But I thought maybe having bite marks as if it had been eaten away may fit with the story. Final art for the November issue of Highlights. There you have it! A behind the scenes in the Sweet-Treat Schoolhouse! Check it out in the November 2017 issue of Highlights Magazine! 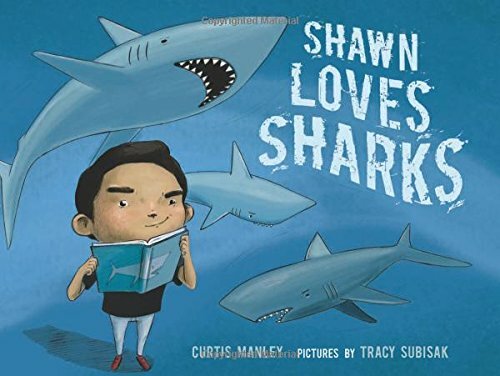 7 Great Kids Picture Books for Shark Week! 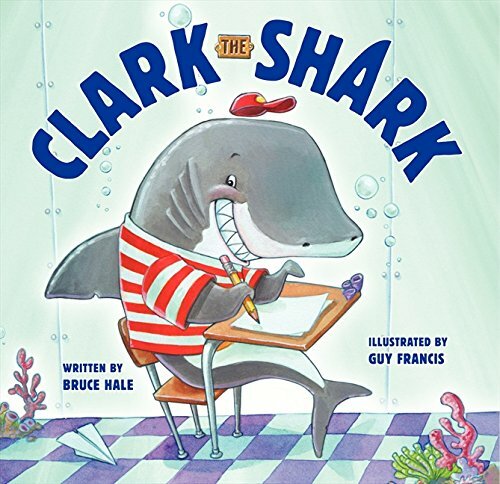 Here are some of my favorite Sharky books to celebrate shark week! Nothing to be scared of, just some fin-tastic fun! One of my very favorite pictures books! I’m a fan of Tammi Sauers writing and also of Michael Slack’s colorful, quirky and fun art. 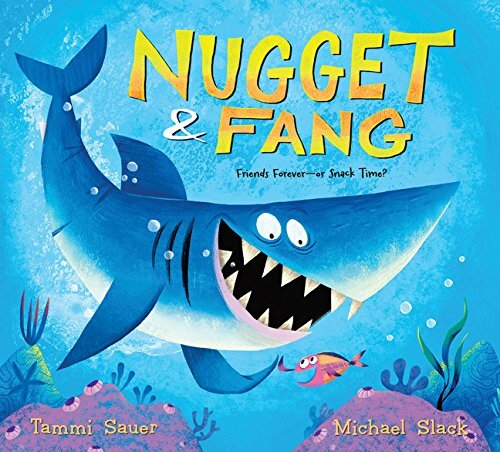 Nugget the minnow and Fang the shark’s friendship is tested when Nugget learns that sharks eat minnows and also that he is apparently delicious. 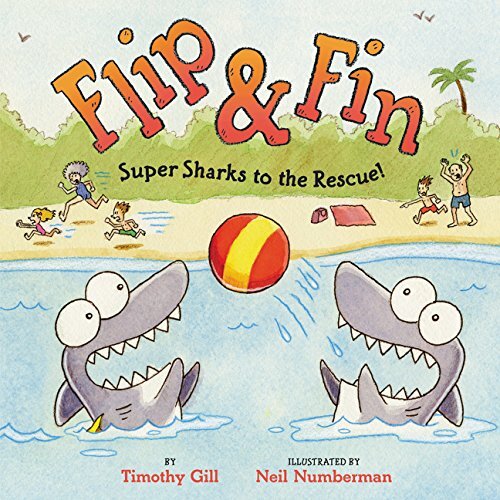 Flip & Fin: Super Sharks to the Rescue! Faster than a sailfish, tougher than a clamshell! Flip and Fin the sand tiger shark twins save the coastline from a nefarious foreign object just like their favorite TV superheroes! Shark loves sharks, but isn’t too crazy about Stacy. It’s Predator Day at school and she just got assigned the great white shark. Shawn’s favorite animal. And what did Shawn get assigned? 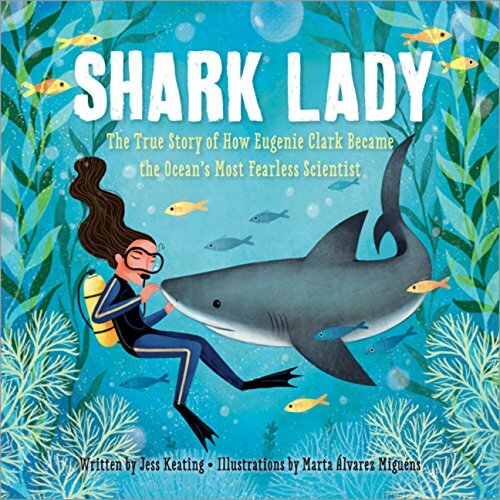 The true story of scientist Eugenie Clark, who believed sharks were beautiful, misunderstood creatures. I share that view with Eugenie. 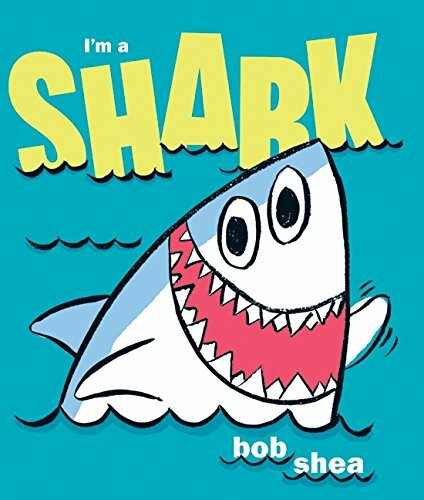 A great story packed with fun shark facts! I love Bob Shea’s sense of humor. I’m a Shark explores how cool it is to be a shark and how they aren’t afraid of anything. Well, almost. I won’t mention it here because it would be too scary. A little healthy competition is good for everyone, right? 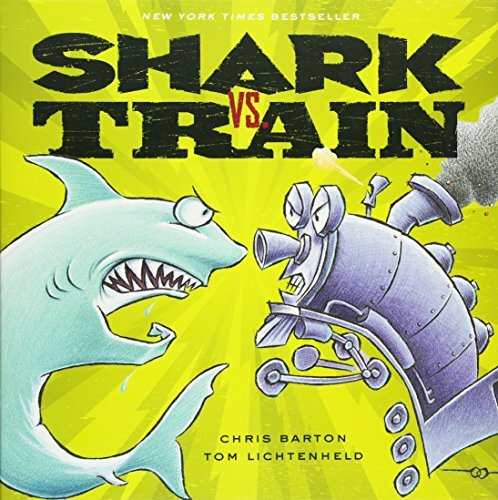 What about when Shark and Train compete in pie eating, piano playing and burping? Who will win? Clark is super-excited about school and most things, really. His zeal gets to be a little much to endure for his new schoolmate and his teacher Mrs Inkydink swims in to help him relax a bit. Sketching up an adventure! Yay for Power Wheels! Always fun to get out and explore with a friend (and a happy dog leading the way! ).